Objective To examine the association between exposure to newer antidepressants and risk of gastrointestinal (GI) and other bleeding complications among individuals with major depressive disorder (MDD). Design This study uses an incident user cohort design to compare associations between incidence of vascular/bleeding events and the relative affinity (low, moderate or high) of the antidepressant for the serotonin transporter during an exposure risk period for each patient. Setting New England healthcare system electronic medical record database. Participants 36 389 individuals with a diagnosis of MDD and monotherapy with a selective serotonin reuptake inhibitor, serotonin–norepinephrine reuptake inhibitor or other new-generation antidepressant were identified from among 3.1 million patients in a New England healthcare system. Primary and secondary outcome measures Rates of bleeding or other vascular complications, including acute liver failure, acute renal failure, asthma, breast cancer and hip fractures. Results 601 GI bleeds were observed in the 21 462 subjects in the high-affinity group versus 333 among the 14 927 subjects in the lower affinity group (adjusted RR: 1.17, 95% CI 1.02 to 1.34). Similarly, 776 strokes were observed in the high-affinity group versus 434 in the lower affinity treatment group (adjusted RR: 1.18, 95% CI 1.06 to 1.32). 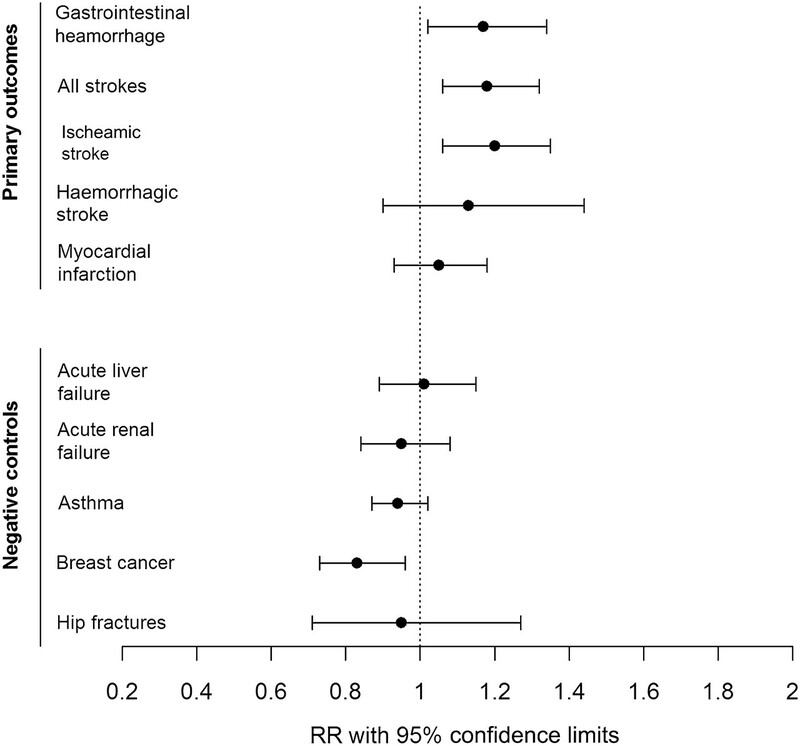 No significant association with risk for a priori negative control outcomes, including acute liver failure, acute renal failure, asthma, breast cancer and hip fractures, was identified. Conclusions Use of antidepressants with high affinity for the serotonin transporter may confer modestly elevated risk for GI and other bleeding complications. While multiple methodologic limitations must be considered, these results suggest that antidepressants with lower serotonin receptor affinity may be preferred in patients at greater risk for such complications. Previous reports have suggested that antidepressant use may contribute to dysfunction in platelet aggregation and increased risk for bleeding outcomes. The authors hypothesised that antidepressants with higher affinity for the serotonin transporter would exhibit greater risk for these outcomes than those with lesser affinity. Use of antidepressants with higher affinity for the serotonin transporter was associated with modest but statistically significant increase in risk for gastrointestinal bleed and stroke. Electronic medical record-based pharmacovigilance systems provide an opportunity to examine treatment risk in general clinical populations, in a more systematic fashion than traditional postmarketing surveillance. A strength of this report, in addition to cohort size and generalisability, is the restriction to individuals with major depressive disorder, minimising risk for confounding by indication. A key limitation is the absence of blood antidepressant levels or data on adherence, which might lead us to underestimate strength of effect. While the precise mechanism of therapeutic action of SSRIs is not known, their common mechanism of action is inhibition of the serotonin transporter, responsible for removal of serotonin from the synapse. Apart from its central nervous system effects, serotonin is known to be a vasoactive and thrombostatic amine.5 Since the serotonin transporter is also expressed in platelets, there has been an active debate in the literature regarding the effects of SSRIs on the vascular system. Multiple studies suggest that SSRIs are generally safe in patients with vascular disease6 and have beneficial effects in such patients by decreasing platelet aggregation7 8 and by vasodilation.9 10 Other studies, however, have associated the use of SSRIs with increased incidence of vasospasm and poor clinical outcomes after subarachnoid haemorrhage11 as well as increased mortality and poor cardiovascular outcomes after coronary artery bypass grafting.12 Thus, while beneficial in some contexts, the peripheral effects of SSRIs and other serotonergic antidepressants might also be expected to confer increased risk for vascular or bleeding complications. A key limitation in many of these studies is the difficulty in adequately matching antidepressant-exposed subjects with controls. This may contribute to confounding by indication: that is, the same variables (ie, depression and associated symptoms) which lead an individual to be prescribed an antidepressant may increase that individual's risk of adverse outcomes. In particular, psychological distress27 and depression28 have been reported to be risk factors for cardiovascular events. A recent large case-crossover study and a population-based cohort study address some of these limitations but do not fully address the substantial risk of confounding by indication.23 24 The need for further characterisation of the relationship between SSRIs and adverse bleeding events is apparent29 30: beyond the need to confirm such a relationship using a methodology less subject to confounding, the magnitude and specificity of risk remains unclear. Therefore, we adopted an alternative approach to estimate risk associated with antidepressants, contrasting those with highest affinity for the serotonin transporter with those of low or moderate affinity. Based upon the acute effects of these agents on platelet serotonin transport, we hypothesised that high-affinity agents would be associated with greater risk of bleeding or vascular events than lower affinity ones. This approach lessens risk of confounding by focusing only on depressed antidepressant-treated patients, particularly as clinicians typically do not consider affinity per se when selecting among the numerous available antidepressants. We examined data from in- and outpatient medical records for over 3 million individuals in a large New England healthcare system. The Partners HealthCare electronic medical record (EMR) incorporates sociodemographic data, billing codes, laboratory results, problem lists, medications, vital signs and narrative notes from Massachusetts General Hospital and Brigham and Women's Hospital, as well as community and specialty hospitals which are part of the Partners HealthCare System in Boston (Massachusetts, USA). Altogether, these records comprise about 3.1 million unique patients. Patients with the presence of at least one diagnosis of major depression determined by the presence of International Classification of Diseases, 9th edition codes (ICD-9 296.2×, 296.3×), in the billing data or outpatient medical record were selected from the EMR for inclusion in a data set (referred to as a data ‘mart’). The data mart consists of all electronic records (psychiatric and non-psychiatric) from 127 504 patients and can be utilised with the i2b2 server software (i2b2 v1.4).31 The present analysis included records from February 1990 to October 2009. The i2b2 system32 33 is a scalable computational framework, deployed at over 46 major academic health centres, for managing human health data, and the i2b2 Workbench facilitates analysis and visualisation of such data. The Partners Institutional Review Board approved all aspects of this study. Subjects were classified into groups based upon documented antidepressant treatment from three sources: (1) medications prescribed to the patient via e-prescribing in the EMR, (2) medication documented but not prescribed by the documenting clinician and (3) medication dispensed by the inpatient pharmacy. The three primary groups were labelled ‘high’, ‘moderate’ and ‘low’ affinity for the serotonin transporter, based upon previous work.34 Classification of newer antidepressants, including duloxetine and escitalopram, was based upon Ki (table 1) 35–37—in the case of escitalopram, effective affinity is greater than citalopram because of the absence of the R enantiomer, which has demonstrated antagonistic effects.38–40 As reported affinities vary across publications,37 41–44 we prioritised comparative affinities reported by a single laboratory42 wherever possible and categories utilised in prior studies employing similar methodology to this one.35 Patients with multiple antidepressant prescriptions from different affinity groups were excluded from the analysis, as were those receiving tricyclic antidepressants or monoamine oxidase inhibitors, out of concern that these groups would not be well matched with those receiving newer treatments and to avoid the known cardiovascular risks associated with some older agents. For initial analysis, the ‘high’-affinity group was contrasted with the other two groups to yield two similarly sized cohorts for comparison, based on investigator consensus and recognising that other groupings might be equally reasonable. A further advantage of this distinction was that it assigned duloxetine and venlafaxine to different categories based on serotonin reuptake affinity, decreasing the likelihood of confounding by non-serotonergic (ie, noradrenergic) effects. The groups were first compared in terms of sociodemographic features, including age, gender and race and antidepressant use. As electronic medical records data are not well suited to standard survival analytic approaches, we utilised an incident user cohort design to construct an exposure risk period for each patient. 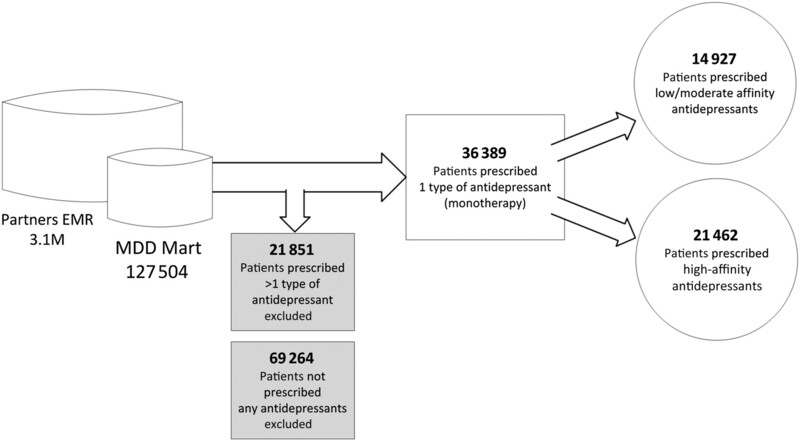 This method was proposed by Schneeweiss45 specifically for pharmacovigilance designs using electronic medical record and is conceptually related to prior approaches.46 This approach has previously demonstrated assay sensitivity in pharmacovigilance studies using similarly structured data.47 48 The exposure period begins on the date an antidepressant was prescribed and ends 30 days from prescription. If a second prescription is documented in the 30-day period, the period is extended another 30 days from this prescription. Patient analysis is censored as soon as their exposure risk period ends, that is, at the end of a continuous documented period of exposure. Outcomes occurring within any of the exposure periods are included in the analysis. Logistic regression was used to calculate crude RR, and RR was then adjusted for person-months of exposure and other potential confounding variables identified in the initial analysis of baseline characteristics. To examine the importance of this 30-day assumption, we also conducted a sensitivity analysis as a means of determining if the length of the exposure risk period had a meaningful impact on our analysis. We re-ran the analysis for all the outcomes with drug era windows of 60, 90 and 180 days. Adjusted RR and CIs are provided in table S3. Three sets of analysis were performed. First, we examined associations between antidepressant group and vascular/bleeding events (primary outcomes) including gastrointestinal (GI) haemorrhage, myocardial infarction and stroke. Follow-up analysis examined each category of stroke (ischaemic or haemorrhagic) separately. For consistency with prior reports, we also conducted a secondary analysis on a subset of patients with more conservative criteria for selecting patients with major depressive disorder (MDD) (at lease two outpatient diagnoses or at least one inpatient diagnosis). Next, as a positive control or test for assay sensitivity, we examined association between aspirin exposure and GI bleed. Finally, as a negative control, we examined associations between antidepressant group and five outcomes selected by the clinical investigators (RHP, JWS, DVI and IK) based upon literature review as likely to be unrelated to serotonergic effects: acute liver failure, acute renal failure, asthma, breast cancer and hip fractures. Table S1 lists the ICD-9 codes used to identify these outcomes of interest. All analyses utilised R 2.13.1 (The R Foundation for Statistical Computing). Of 127 504 individuals with MDD, 58 690 (45%) received at least one prescription for a newer antidepressant. Thirty six thousand three hundred and eighty nine of these patients were prescribed only one type of antidepressant, while 21 851 individuals were prescribed antidepressants from different affinity groups at any time during the study period and were excluded from the analysis (figure 1). Of the single group-treated patients, 14 927 were treated with low–moderate affinity and 21 462 with high affinity, representing 44 235 patient-months of treatment in the lower group and 74 706 in the higher group. Table 2 shows associations between treatment groups and baseline characteristics. Compared with low–moderate affinity treatments, patients with high-affinity treatments were more likely to be female, non-Caucasian and very slightly older (difference in mean age between groups was <1 year). They exhibited no significant differences in total number of prescription refills or overall utilisation of the healthcare system (as measured by number of ‘facts’ in the data mart, which include billing codes, medications, procedures or other individual data points). Our adjusted models therefore included age, gender, race and aspirin use as covariates. For a small subset of patients, depression severity (assessed using the Quick Inventory of Depressive Symptomatology-Self-Report49) was available in the EMR because the clinicians in some practices employ this scale routinely. To address the possibility that our results were confounded by severity, we examined depression severity by affinity group in an exploratory fashion. We did not detect a significant difference between groups as measured by mean Quick Inventory of Depressive Symptomatology-Self-Report score (L/M: 10.6±5.3, H: 10.3±5.3, p=0.728) (table 2). Figure 2 indicates adjusted RR and 95% CIs by treatment group for outcomes of interest and negative controls. RR significantly >1 was observed in GI haemorrhage (adjusted RR: 1.17, 95% CI 1.02 to 1.34) and strokes (adjusted RR: 1.18, 95% CI 1.06 to 1.32) between the low–moderate and high-affinity groups, but not in myocardial infarctions (adjusted RR: 1.05, 95% CI 0.93 to 1.18). When stroke type (ischaemic or haemorrhagic) was examined, significant effects were observed for ischaemic strokes (adjusted RR: 1.20, 95% CI 1.06 to 1.35), but not haemorrhagic strokes (adjusted RR: 1.13, 95% CI 0.90 to 1.44). In the latter case, the point estimate of effect was similar to that for all strokes, but the smaller number of events yielded a broader CI. Outcomes of interest for each antidepressant are listed in table S2. A secondary analysis on a subset of patients with more conservative criteria for selecting patients with MDD yielded similar results (table S4). Adjusted RR and 95% CIs for primary outcomes and negative controls. As expected, aspirin exposure was also associated with risk for GI bleed (crude RR: 12.3995, 95% CI 2.39 to 3.12). In a fully adjusted model including age, gender, race, antidepressant treatment group, aspirin and treatment group-by-aspirin interaction, no evidence of antidepressant treatment group-by-aspirin interaction was observed (for interaction term, p=0.630) (table 3). In our analysis of negative control conditions with no known or postulated associations to antidepressants, no significant associations with affinity group were identified (figure 2). These included both acute diagnoses (acute renal failure, acute hepatic failure, hip fracture) and chronic diagnoses (asthma, breast cancer). In a sensitivity analysis examining the interval of risk associated with antidepressant exposure, outcomes within a 60-, 90-, or 180-day exposure window following antidepressant prescription were examined. Results were generally similar to those observed for the primary analysis (table S3), persistently indicating elevated risk for stroke and GI bleed but not for the control conditions. In this pharmacovigilance study using data from 127 504 individuals with MDD in a single large healthcare system, we identified a significantly elevated risk for GI haemorrhage and stroke when high-serotonin transporter affinity antidepressants were prescribed compared with low-serotonin transporter affinity antidepressants. No such effects were observed for other general medical conditions selected a priori as negative controls, suggesting that this association is less likely to represent a non-specific effect of treatment. Our results are consistent with prior reports which detected a risk of GI bleed among SSRI-treated patients.15 17–19 24 For example, a large Scandinavian population-based study found SSRI use to be associated with 3.6-fold greater risk of upper GI bleed, an effect potentiated by NSAID or aspirin use.18 However, not all such studies found this risk.50 51 While most previous studies compared antidepressant-treated patients to untreated patients, with consequent risk of confounding by indication, the present work minimises this risk by comparing antidepressant treatments based on affinity for the serotonin transporter. Thus, presence of depression alone cannot account for the observed effects. We also detected elevated risk for stroke in high-affinity antidepressant-treated patients. A similar point estimate was identified when the analysis was limited to individuals in whom the stroke type was characterised as haemorrhagic, although the 95% CI did not exclude one. In light of the smaller number of events in this analysis, as well as the potential for misclassification in diagnosis based on claims data, the difference among haemorrhagic stroke patients is perhaps not surprising. Previous studies have also suggested elevated risk of stroke with SSRI or other antidepressant treatment.20 22 24 Data from the Women's Health Initiative found SSRI prescription to be associated with elevated stroke risk after adjustment for other cardiovascular risk factors.20 Likewise, a large population-based cohort study of individuals age 65 or older found an association between SSRI or other (non-tricyclic) antidepressant use and stroke risk compared with untreated individuals.24 Neither study, however, can fully exclude confounding by indication. On the other hand, a nested case–control study reported a lack of association between SSRI use and haemorrhagic stroke,25 and a case-crossover study likewise observed increased ischaemic but not haemorrhagic stroke risk.23 In light of these effects, the impact of antidepressants might be better understood as dysregulation of coagulation rather than simply an increase in bleeding per se. A notable advantage of EMR- or claims-based pharmacovigilance studies is their potential to rapidly identify risk that might otherwise go undetected in randomised controlled trials. For example, a previous study of rosiglitazone identified elevated risk of myocardial infarction, before similar data from prospective studies led the US FDA to consider withdrawing that drug from the market.47 Confidence in our ability to detect a ‘true’ signal using our methodology is increased by the detection of association between aspirin treatment and GI bleed, a well-known complication of aspirin treatment, as well as by the negative findings among the negative control diagnoses. We note several limitations in considering our results. First, we cannot exclude the possibility of residual confounding arising from differences in the treatment groups in this non-randomised cohort and specifically the potential for biased assignment to one antidepressant category. In general, most clinicians are unaware of the differences in affinity between SSRIs, so this would be unlikely to influence clinical decision-making. Among the low-affinity antidepressants are primarily non-SSRIs, which may be selected based upon some clinical consideration. On the other hand, bupropion, a low-affinity antidepressant, is indicated for smoking cessation and prescribed for depressed individuals who smoke. Because smoking is a risk factor for stroke, one would expect this low-affinity antidepressant to be associated with stroke risk, which would have an effect opposing the one we observed. Similarly, non-SSRI antidepressants are often second-line treatment suggesting that individuals in the lower affinity group might be more treatment resistant and, therefore, at greater risk for vascular complications. Because we observed the opposite trend, it is unlikely that these results are confounded by greater depression severity in the high-affinity group. Further, while depression severity on a standardised scale was available only for a small subset of individuals, that measure did not support a confounding effect of severity. Another limitation in the present analysis is the inability to reliably characterise blood levels for individual treatments, which in addition to affinity will determine extent of binding to serotonin transporter.52 Many factors, including dose and adherence (including unfulfilled prescriptions) and individual differences in metabolism and concomitant medications will impact blood level; correlation between individual characteristics such as dosage and blood level may be modest.53 These sources of heterogeneity should be consistent across treatment groups, however, so if anything we would anticipate them to bias our results towards an absence of association. Still, our results must be interpreted cautiously with these restrictions in mind. Nonetheless, our results add to a growing body of evidence that some newer antidepressants may be associated with elevated risks of GI bleeding and stroke. We emphasise that these risks must be balanced against the voluminous evidence of benefit from treatment of depression. Still, if confirmed by further investigation, it may be possible to achieve these benefits while minimising risk by selecting antidepressants with lesser affinity for the serotonin transporter. More broadly, our results further indicate the potential utility of large electronic medical record systems in understanding the clinical risks of pharmacotherapy in psychiatry. U.S. Sales and Prescription Information. IMS Health, 2009. (accessed 15 Mar 2012). American Psychiatric Association (APA). Practice guideline for the treatment of patients with major depressive disorder. 3rd ed. Arlington, VA: American Psychiatric Association (APA), 2010.
. Comparative efficacy and acceptability of 12 new-generation antidepressants: a multiple-treatments meta-analysis. Lancet 2009;373:746–58.
. 5-hydroxytryptamine and cardiovascular regulation. Trends Pharmacol Sci 2008;29:472–81.
. Sertraline treatment of major depression in patients with acute MI or unstable angina. JAMA 2002;288:701–9.
. Selective serotonin reuptake inhibitors yield additional antiplatelet protection in patients with congestive heart failure treated with antecedent aspirin. Eur J Heart Fail 2003;5:517–21.
. Hypothesis: antiplatelet effects of selective serotonin reuptake inhibitors cause clinical benefits on cardiovascular disease and increase risks of bleeding. J Cardiovasc Pharmacol Ther 2005;10:163–4.
. Serotonin reuptake inhibitor fluoxetine decreases arteriolar myogenic tone by reducing smooth muscle [Ca2+]i. J Cardiovasc Pharmacol 2000;35:849–54.
. Sertraline causes strong coronary vasodilation: possible relevance for cardioprotection by selective serotonin reuptake inhibitors. Cardiovasc Drugs Ther 2004;18:441–7.
. SSRI and statin use increases the risk for vasospasm after subarachnoid hemorrhage. Neurology 2005;64:1008–13.
. Prognosis of patients taking selective serotonin reuptake inhibitors before coronary artery bypass grafting. Am J Cardiol 2006;98:42–7.
. Inhibition of serotonin reuptake by antidepressants and upper gastrointestinal bleeding in elderly patients: retrospective cohort study. BMJ 2001;323:655–8.
. Selective serotonin reuptake inhibitors are associated with a modest increase in the risk of upper gastrointestinal bleeding. Am J Gastroenterol 2009;104:1475–82.
. SSRIs and upper gastrointestinal bleeding: what is known and how should it influence prescribing? CNS Drugs 2006;20:143–51.
. Gastro-intestinal haemorrhage risks of selective serotonin receptor antagonist therapy: a new look. Br J Clin Pharmacol 2008;66:76–81.
. Increased bleeding risk with concurrent use of selective serotonin reuptake inhibitors and coumarins. Arch Intern Med 2008;168:180–5.
. Use of selective serotonin reuptake inhibitors and risk of upper gastrointestinal tract bleeding: a population-based cohort study. Arch Intern Med 2003;163:59–64.
. Risk of clinically relevant bleeding in warfarin-treated patients–influence of SSRI treatment. Pharmacoepidemiol Drug Saf 2009;18:412–16.
. Antidepressant use and risk of incident cardiovascular morbidity and mortality among postmenopausal women in the women's health initiative study. Arch Intern Med 2009;169:2128–39.
. Cerebrovascular effects of selective serotonin reuptake inhibitors: a systematic review. J Clin Psychiatry 2004;65:1642–53.
. Risk of ischemic stroke associated with antidepressant drug use in elderly persons. J Clin Psychopharmacol 2010;30:252–8.
. Association of cerebrovascular events with antidepressant use: a case-crossover study. Am J Psychiatry 2011;168:511–21.
. Antidepressant use and risk of adverse outcomes in older people: population based cohort study. BMJ 2011;343:d4551.
. Selective serotonin reuptake inhibitors and the risk of stroke: a population-based case-control study. Stroke 2002;33:1465–73.
. Hemorrhagic stroke associated with antidepressant use in patients with depression: does degree of serotonin reuptake inhibition matter? Pharmacoepidemiol Drug Saf 2009;18:196–202.
. Psychological distress, major depressive disorder, and risk of stroke. Neurology 2008;70:788–94.
. Depressive symptoms and risk of stroke: the Framingham study. Stroke 2007;38:16–21.
. Depression and risk of sudden cardiac death and coronary heart disease in women: results from the nurses' health study. J Am Coll Cardiol 2009;53:950–8.
. Architecture of the open-source clinical research chart from informatics for integrating biology and the bedside. AMIA Annu Symp Proc 2007:548–52.
. Instrumenting the health care enterprise for discovery research in the genomic era. Genome Res 2009;19:1675–81.
. Serving the enterprise and beyond with informatics for integrating biology and the bedside (i2b2). J Am Med Inform Assoc 2010;17:124–30.
. Risk of upper gastrointestinal bleeding and the degree of serotonin reuptake inhibition by antidepressants: a case-control study. Drug Saf 2008;31:159–68.
. Antidepressants targeting the serotonin reuptake transporter act via a competitive mechanism. J Pharmacol Exp Ther 2008;327:982–90.
. Kinetic and thermodynamic assessment of binding of serotonin transporter inhibitors. J Pharmacol Exp Ther 2008;327:991–1000.
. Milnacipran: a comparative analysis of human monoamine uptake and transporter binding affinity. Biol Psychiatry 2004;55:320–2.
. R-citalopram functionally antagonises escitalopram in vivo and in vitro: evidence for kinetic interaction at the serotonin transporter. Br J Pharmacol 2004;142:172–80.
. Higher serotonin transporter occupancy after multiple dose administration of escitalopram compared to citalopram: an [123I]ADAM SPECT study. Psychopharmacology (Berl) 2007;191:333–9.
. Escitalopram, an antidepressant with an allosteric effect at the serotonin transporter-a review of current understanding of its mechanism of action. Psychopharmacology (Berl) 2012;219:1–13.
. Pharmacological characterization of selective serotonin reuptake inhibitors (SSRIs). Int Clin Psychopharmacol 1994;9(Suppl 1):19–26.
. Neurotransmitter receptor and transporter binding profile of antidepressants and their metabolites. J Pharmacol Exp Ther 1997;283:1305–22.
. Tricyclic antidepressant pharmacology and therapeutic drug interactions updated. Br J Pharmacol 2007;151:737–48.
. Pharmacological profile of antidepressants and related compounds at human monoamine transporters. Eur J Pharmacol 1997;340:249–58.
. A basic study design for expedited safety signal evaluation based on electronic healthcare data. Pharmacoepidemiol Drug Saf 2010;19:858–68.
. Analysis of survival data by the proportional odds model. Stat Med 1983;2:273–7.
. Rapid identification of myocardial infarction risk associated with diabetes medications using electronic medical records. Diabetes Care 2010;33:526–31.
. HealthMap: the development of automated real-time internet surveillance for epidemic intelligence. Euro Surveill 2007;12:E071129–25.
. Selective serotonin reuptake inhibitors and risk of hemorrhagic stroke. Stroke 2007;38:3049–51.
. Antidepressants, warfarin, and the risk of hemorrhage. J Clin Psychopharmacol 2005;25:561–4.
. The influence of selective serotonin reuptake inhibitors on human platelet serotonin. Thromb Haemost 2004;91:119–28.
. Testing for cytochrome p450 polymorphisms in adults with non-psychotic depression treated with selective serotonin reuptake inhibitors (SSRIs). Evid Rep Technol Assess (Full Rep) 2007;146:1–77. Contributors VC designed the tools for collecting data, cleaned and analysed the data and drafted and revised the manuscript. He is a guarantor. PJG contributed to interpretation of analysis and drafted and revised the manuscript. CCC contributed to preparation of the manuscript. SM designed the tools for collecting data and contributed to interpretation of analysis and preparation of manuscript. VG, MF, JW, SC, IK and DVI contributed to interpretation of analysis and preparation of manuscript. JWS designed the study and contributed to interpretation of analysis and preparation of manuscript. RP initiated the project, designed the study, monitored the analyses and drafted and revised the manuscript. He is a guarantor. All authors have approved the final version. Funding The project described was supported by Award # 2U54LM008748 from the NIH/National Library of Medicine (to IK) and R01MH086026 from the National Institute of Mental Health (to RP). The content is solely the responsibility of the authors and does not necessarily represent the official views of the National Library of Medicine or the National Institutes of Health. Disclosures Maurizio Fava—Lifetime Disclosures. Abbott Laboratories; Alkermes, Inc.; Aspect Medical Systems; AstraZeneca; BioResearch; BrainCells Inc.; Bristol-Myers Squibb; Cephalon, Inc.; Clinical Trials Solutions, LLC; Covidien; Eli Lilly and Company; EnVivo Pharmaceuticals, Inc.; Forest Pharmaceuticals, Inc.; Ganeden Biotech, Inc.; GlaxoSmithKline; Johnson & Johnson Pharmaceutical Research & Development; Lichtwer Pharma GmbH; Lorex Pharmaceuticals; Novartis AG; Organon Pharmaceuticals; PamLab, LLC; Pfizer Inc.; Pharmavite® LLC; Roche; RTC Logic, LLC; Sanofi-Aventis US LLC; Shire; Solvay Pharmaceuticals, Inc.; Synthelabo; Wyeth-Ayerst Laboratories. Advisory/Consulting: Abbott Laboratories; Affectis Pharmaceuticals AG; Amarin Pharma Inc.; Aspect Medical Systems; AstraZeneca; Auspex Pharmaceuticals; Bayer AG; Best Practice Project Management, Inc.; BioMarin Pharmaceuticals, Inc.; Biovail Corporation; BrainCells Inc; Bristol-Myers Squibb; CeNeRx BioPharma; Cephalon, Inc.; Clinical Trials Solutions, LLC; CNS Response, Inc.; Compellis Pharmaceuticals; Cypress Pharmaceutical, Inc.; Dov Pharmaceuticals, Inc.; Eisai Inc.; Eli Lilly and Company; EPIX Pharmaceuticals, Inc.; Euthymics Bioscience, Inc.; Fabre-Kramer Pharmaceuticals, Inc.; Forest Pharmaceuticals, Inc.; GenOmind, LLC; GlaxoSmithKline; Gruenthal GmbH; Janssen Pharmaceutica; Jazz Pharmaceuticals, Inc.; Johnson & Johnson Pharmaceutical Research & Development, LLC. ; Knoll Pharmaceuticals Corp.; Labopharm Inc.; Lorex Pharmaceuticals; Lundbeck Inc.; MedAvante, Inc.; Merck & Co., Inc.; Methylation Sciences; Neuronetics, Inc.; Novartis AG; Nutrition 21; Organon Pharmaceuticals; PamLab, LLC. ; Pfizer Inc.; PharmaStar; Pharmavite® LLC. ; Precision Human Biolaboratory; Prexa Pharmaceuticals, Inc.; PsychoGenics; Psylin Neurosciences, Inc.; Ridge Diagnostics, Inc.; Roche; RCT Logic, LLC; Sanofi-Aventis US LLC. ; Sepracor Inc.; Schering-Plough Corporation; Solvay Pharmaceuticals, Inc.; Somaxon Pharmaceuticals, Inc.; Somerset Pharmaceuticals, Inc.; Synthelabo; Takeda Pharmaceutical Company Limited; Tetragenex Pharmaceuticals, Inc.; TransForm Pharmaceuticals, Inc.; Transcept Pharmaceuticals, Inc.; Vanda Pharmaceuticals, Inc.; Wyeth-Ayerst Laboratories. Speaking/Publishing: Adamed, Co; Advanced Meeting Partners; American Psychiatric Association; American Society of Clinical Psychopharmacology; AstraZeneca; Belvoir Media Group; Boehringer Ingelheim GmbH; Bristol-Myers Squibb; Cephalon, Inc.; Eli Lilly and Company; Forest Pharmaceuticals, Inc.; GlaxoSmithKline; Imedex, LLC; MGH Psychiatry Academy/Primedia; MGH Psychiatry Academy/Reed Elsevier; Novartis AG; Organon Pharmaceuticals; Pfizer Inc.; PharmaStar; United BioSource, Corp.; Wyeth-Ayerst Laboratories. Equity Holdings: Compellis Royalty/patent, other income: Patent for SPCD and patent application for a combination of azapirones and bupropion in major depressive disorder, copyright royalties for the MGH CPFQ, SFI, ATRQ, DESS and SAFER. RHP has received consulting fees or served on scientific advisory boards for Proteus Biomedical, Concordant Rater Systems, Genomind and RIDventures; research grant support from Proteus Biomedical and royalties from Concordant Rater Systems. JWS has served as a consultant for The Medical Letter. DVI has received payment for lectures including service on speakers' bureaus from the MGH Psychiatry Academy and has served as a consultant for CNS Response, Inc. Patient consent This is a retrospective health care utilization/clinical study involving potentially hundreds of thousands of patients and multiple years of data—that is, consent could not feasibly be obtained from all subjects. Data sharing statement Additional data can be found in tables S1–S4.